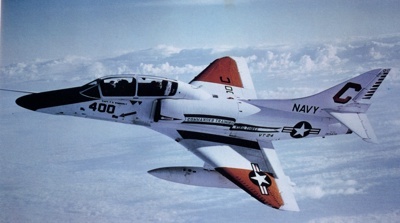 For many years, there have been a smattering of TA-4 decals from SuperScale, but none of them represented the standard orange and white schemes that most all the US Navy training aircraft used. Afterburner Decals is fixing this. The third Skyhawk sheet from Afterburner is dedicated to the trainers and has four different orange and white aircraft in addition to some other unique training Skyhawks. The package for these decals is the customary clear zip-lock baggie. The package is thick, having both the decals and three folded 8.5 x 11 inch full color instruction sheets. The register of the decals in my review samples was perfect. 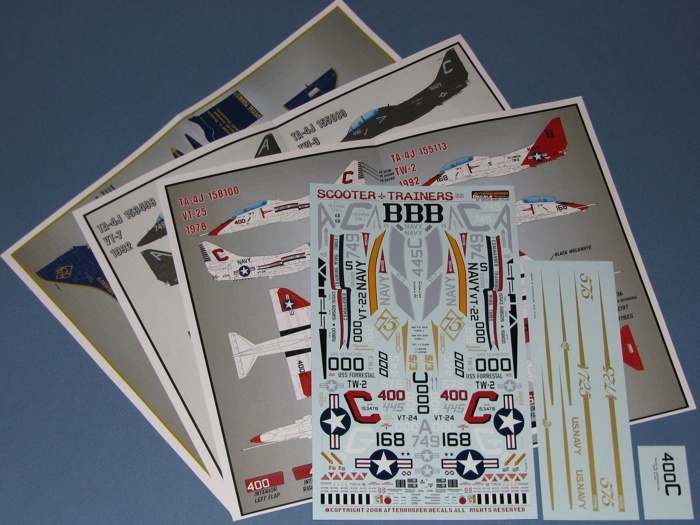 The instructions provides four-view diagrams of each aircraft, so you have everything you need to paint the models. To save some bandwidth in this posting, you can click this link to go to the Afterburner web page displaying the camouflage diagrams. You can even order the sheet right from there! The majority of the decals are found on a single 5 x 8 inch decal sheet. There are two addendum sheets with additional markings that did not fit on the main sheet. There is a healthy amount of airframe data included for two full aircraft, and one set of full color star-and-bars for a single aircraft. The decals, themselves, are printed by Cartograf, which speak volumes to their usability and quality. #1: TA-4J 153498, VT-7, 1992. This aircraft appears to have been a hand-me-down aircraft from VFC-12. It is finished in overall Engine Gray with light gray markings. The images I found of this one show it to have a very weathered look. This looks like it will be a challenge to pull off convincingly -- I like challenges. #2: TA-4J 155089, VT-25, 1990. This aircraft appears to be another hand-me-down aircraft from VFC-12. I could find no images of it, though. #3: TA-4J 158509, VT-22, 1984. This aircraft is a white and orange commander's aircraft, but there is nothing unusual in the markings from any other line aircraft. The image to the right is not the correct nose or BuNo, but is representative of the colors of the aircraft provided by the decal sheet. #4: TA-4J 158100, VT-25, 1982. This aircraft is another white and orange commander's aircraft, but again there is nothing really unusual in the markings from any other line aircraft. #5: TA-4J 155113, VT-22, 1992. 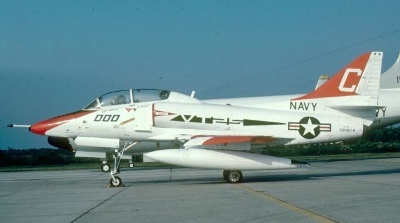 This aircraft sports a test scheme that the US Navy toyed with to improve the visibility of its trainers. As it was not adopted, I can only assume that it was not enough of an improvement in visibility to have the fleet re-painted in this scheme. 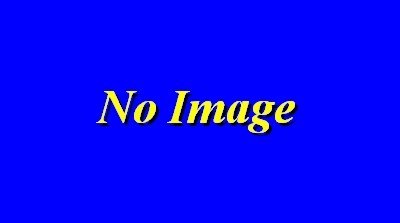 The image to the right is the aircraft at a later point with a different nose number from what is provided on the decal sheet. #6: TA-4J 158100, VT-24, 1978. This is the same aircraft (by BuNo) as #4 above, only it is earlier in the aircraft's life. 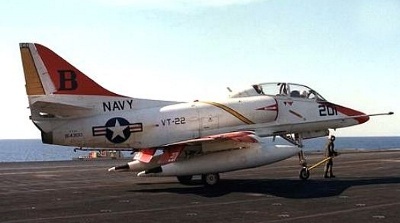 It was a commander's aircraft at this time, too, only for VT-24. The large banners on the sides proclaim its command rank. 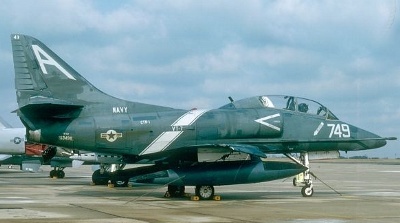 This is the same markings provided in the Hasegawa 1/32nd scale TA-4J Skyhawk kit. #7: TA-4J 154327, VA-45, 1989. 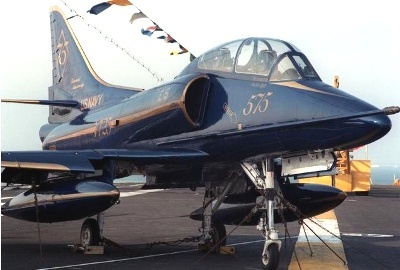 The 75th Anniversary of the US Naval aviation produced many specialty schemes. Each of the VT units painted up one aircraft for the occasion. This is the one done by VT-25. I could find no real faults with these decals. There is one challenge when you go to use them, however. There are a ton of decals on the main decal sheet. Finding the right decals to go on the correct model will take a bit. Unlike the adversary decals that segregated the aircraft markings together, these are jumbled all around the sheet. Most modelers will be able to navigate this issue, though. This is a great decal sheet. 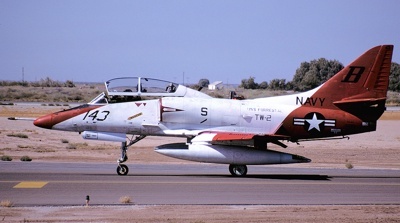 Finally, we have a commercial source for orange and white TA-4 Skyhawks. I made ALPS printed decals for orange and white VT-7 Skyhawks and sold quite a few because there was no other options to be found. With my ALPS supplies dwindling, it is nice that I can point people to this sheet and they can get what they need without my having to use up my ALPS supplies. 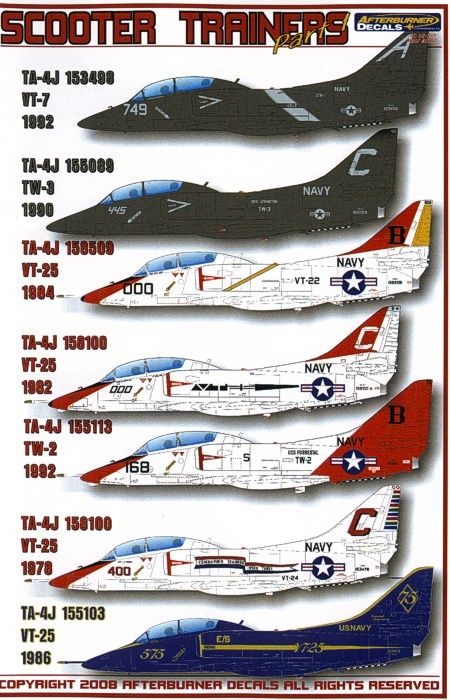 Also, note the "Part 1" in the sheet title -- there are more training Skyhawks coming from Afterburner Decals!